If you are suffering from gum disease, your general dentist may have referred you to a periodontist, a doctor who specializes in gum health. Talk to your periodontist about your desire to undergo orthodontic treatment. They’ll provide you with an honest opinion on whether it is safe for you to do so. In general, if your bone loss is fairly minimal, and the bone is stable enough to endure Invisalign treatment, it is likely that you will be able to receive Invisalign. The dentist who will provide your Invisalign can keep in touch with your periodontist, and the two of them will work as a team to help you achieve a healthier, straighter, and more attractive smile. If it turns out that you are not a candidate for Invisalign, there may be other treatment options that your cosmetic dentist in Yuba City can offer to improve your teeth’s appearance. 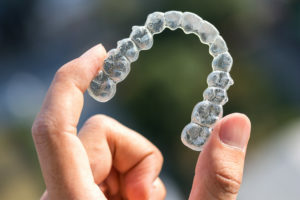 The pressure that Invisalign applies to your teeth may cause a very slight degree of bone loss. However, straightening out your teeth can actually have long-term benefits for your jaw. That is because well-aligned teeth are much easier to keep clean than ones that are overcrowded or otherwise out of place. Therefore, you will have more power to prevent your gum disease from recurring and causing even more damage to your bone. Also, gums tend to fit more tightly around properly aligned teeth. Your newly repositioned smile will therefore be better able to stop the bacteria that causes gum disease from sneaking into your bone. Even before your Invisalign treatment is complete, you may experience some benefits that help you manage your gum disease. For example, since the aligners are removable, you’ll be able to brush and floss your teeth without the use of special tools. Traditional braces lack this advantage, and some people find it challenging to maintain a clean mouth while wearing them. Bone loss doesn’t necessarily rule you out as a candidate for Invisalign. To learn more about whether this orthodontic treatment is right for you, talk to your local team of dental experts. Dr. Ajaipal Sekhon has been serving as a dentist in Yuba City for ten years. He is a certified Invisalign provider and enjoys helping patients to discover the health and aesthetic benefits of well-aligned teeth. To ask questions about this treatment or to schedule a consultation, contact our office at 530-822-9090.